As of Saturday 22 September, the Mongui Maduro library located at Landgoed Rooi Catootje will extend its opening hours. 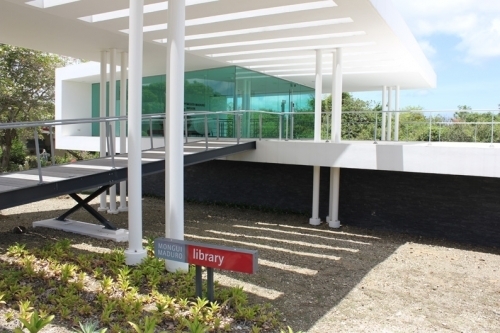 Apart from its regular opening hours this library is now also open on every third Saturday of the Month from 9 am to 12 noon. The Mongui Maduro library is a special library located at a historic location. A special feature of the library is its extensive collection of documents on Jewish history (Judaica) and Curacao history (Antilliana). The collection not only consists of books, but also includes programs of events, invitations, menus and other daily items from the recent and lesser recent past. The basis for the collection was a collection built by the well-known businessman Solomon Abraham Levy (Mongui) Maduro (1891-1967). Under the inspiring leadership of Mongui's daughter Ena Dankmeijer-Maduro (1920-2016) Mongui's collection was developed into a professional library with a wealth of documents for researchers and other interested parties. Not only the collection is special but also the accommodation of the Mongui Maduro library, since 2010 located in a state of the art pavilion on the estate Rooi Catootje is very special. To give more interested persons the chance to discover its hidden treasures as of September 22th the Library will open her doors to the public on each third Saturday of the Month.